The take-off in motorgliders looks more like a take-off with a small aircraft and during the 45 minutes of this flight the motoplaner is less dependent on the thermal ascents as the pure glider. Motorglider "Super-Dimona" with fixed propeller used for these guestflights. Since this type of flight is less dependent on the weather, it can be done by appointment. Within 45 minutes (Round trip - speed 180kmh), the pilot will fly to a destination of your choice (above the Grand Duchy and outside the airport control zone). The price of this guestflight is 200€ for 45 minutes. This most spectacular version of the guestflight combines the advantages of the motorglider with those of the silent flight of the pure glider. The price of this guestflight is 150€ for 45 minutes. Flight procedure: autonomous take-off, followed by a enginer-assisted climb up to an altitude of 1200m above the Esch / Sûre lake. Then complete engine shutdown followed by a silent glide back to Useldange. Tourist flight "The 12 Castles"
This flight will be carried out on our "Super-Dimona" motorglider with fixed propeller that is suitable for low-level flights (300m), so that we can admire the landscape and the castles more closely. The price of this guestflight is 200€ for 45 minutes. 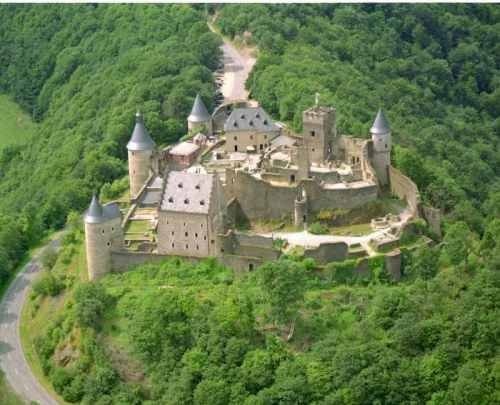 This flight of 45-50 minutes goes will take you the following 12 castles: Koerich, Ansembourg, Larochette, Echternach Basilica, Beaufort, Vianden, Brandenburg, Boursched Clerveaux and finally the return via Esch / Sûre and the lake via Colmar Berg to Useldange .